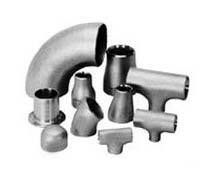 We are a reputed company engaged in the exporting and supplying of Buttweld Pipe Fittings. Our Buttweld Pipe Fittings are sourced from only the reputed vendors ensuring about the quality of the Buttweld Pipe Fittings. The corrosion resistant and durable Buttweld Pipe Fittings find their usage in different industries including the Gas Plants, Chemical Plants, Petroleum Industry, Power Plants, Metallurgy Industry, Shipbuilding Industry, Construction Industry, etc. Stainless Steel ASTM A403 WP 304/ 304L/ 304H/ 316/ 316L/ 317/ 317L/ 321/ 310/ 347/ 904L/ etc. Carbon Steel ASTM A234 WPB / A420 WPL3/ A420 WPL6/ MSS-SP-75 WPHY 42/46/52/56/60/65/70 etc. Alloy Steel ASTM A234 WP1/ WP5/ WP9/ WP11/ WP22/ WP91/ etc. Types Elbow, Tee, Reducer, Return Bends, Stub-Ends, Cap , Collar, Cross, Insert etc.